The Sinclair family who lived at Rosslyn', Antrim Road, Lisburn would have been well known in the town in the years before the First World War. Thomas, the eldest of seven siblings born to William and Anna Jane Sinclair, was a J.P. and chairman of Lisburn Council while his brother William was clerk of Lisburn Board of Guardians. Jack ( John Hamilton Sinclair) the third son who was born about 18791 would have been less conspicuous; he was employed by the Ulster Bank. It was to be a short lived career though, for the Boer War beckoned and on 8 January 19002, along with Holt Waring 3 from Donaghcloney4, he enlisted in the army. They were amongst the first volunteers to join the 45th Co. Imperial Yeomanry, the 'Irish Hunt contingent' led by the Earl of Longford5. New recruits were supposed to be 'good riders and marksmen6 and as a member of the landed gentry it is possible that Waring possessed some of the necessary skills. As a banker7 it is equally probable that Jack Sinclair did not. By 1914 Jack Sinclair had crossed the state line into New Mexico22 and it was there in late August that news of the outbreak of war reached him. He promptly travelled to Port Arthur 23 in Canada, the nearest British military post he could reach. There, at Bustard Camp on 22 October 1914 aged 3524 and giving his profession as 'lawyer', he resumed his military career, enlisting as a private in the 96th Lake Superior Regiment. Despite his previous injuries he was passed fit for overseas service and was chosen to proceed to England with the Machine Gun unit to which he had been attached. 45649 Private John Hamilton Sinclair, banker, commissioned officer in the Imperial Yeomanry, rancher, construction worker, cavalry scout and 'lawyer' was amongst the first Canadian troops to sail for Europe. Meanwhile, the War Office in London had not forgotten him and had dispatched his call-up papers ordering him home for further service. These caught up with him at Salisbury Plain where the Canadians were training. '1 at once ... reported to the O.C. 3rd Battalion Scottish Rifles and found that I was posted to the 12th Battalion25. Thus on 1 March 1915, Private Sinclair was gazetted into the Cameronians as a Lieutenant. At this point Jack Sinclair's career took a turn for the worse. Not that the readers of the News Letter or Lisburn Standard would have been aware of it. For them, the story of his life was presented as 'one of the romances of the war'.26 According to their version he had 'made application after application to proceed to the front.' These, they claimed were refused on the grounds that his injury in South Africa had rendered him unfit for active service. His response was to resign his commission and re-enlist as a private in 2 Argyll and Sutherland Highlanders. As a soldier of humbler rank he had, it appeared, greater success persuading the doctors to agree to his request, and early in 1915 he was posted to France. Things seem to have gone wrong from an early stage. His battalion was stationed at Tain in Ross-shire. Instead of travelling south to France he found himself going north to the Highlands of Scotland, a dozen miles on the wrong side of Invergordon. There, on 1 March 1915 his CO Colonel Anderson reported that, 'J. Hamilton Sinclair ... is unlikely to become a desirable holder of His Majesty's Commission. ... I have had to speak to him severely on account of his intemperance, and now his conduct in the public streets, viz attending a Masonic funeral wearing the insignia of a Masonic lodge on his uniform ... Apart from th [at] ... his manner and general behaviour is a bad example to the younger officers'. Worse was to come. On 16 March the Assistant Adjutant Captain Baker wrote to the battalion commander. [Lieut. J.H. Sinclair] has been absent from parade once more, ... [he] has no respect for the good name of the Regiment and the uniform he wears [and] ... is a very bad example to ... the subalterns.' Nor was he alone in this view. Major Carmichael complained that, 'He is continually applying for leave or absenting himself from parades owing to disability', while Dr. Mackenzie the M.O. considered that he has a generally impaired constitution, and is physically unfit ... to become an efficient soldier'. The War Office was not impressed. 'Having regard to the medical opinion on the state of this officer's health it hardly seems any use giving him another chance.' Nevertheless, before making a decision it was decided to have him examined by a Medical Board. Their report, however, was not what the authorities were expecting. Jack Sinclair, they concluded, was fit for general service. Little's reply was damning, the reason for this officer's failure to take an intelligent interest in the class work arises from his past and present over-indulgence in intoxicants. He has so over-indulged that his mind seems to be now in such a "muddled" state, that he is not in a condition mentally to understand the instructions.' As to the prospect of his commanding a platoon efficiently, 'Practically none. He was not in a condition physically to do so'; or being of any value as an instructor? The answer was unequivocal, `absolutely none'. At the same time Griffiths reported to his superiors outlining what he had happened. 'I have done all in my power to induce this Officer to amend', he observed, 'but there does not appear to be any reasonable prospect of his acquiring the necessary qualifications for leading troops ... and as his example cannot but have the worst possible effect upon the young officers of the Battalion I am strongly of opinion that his removal would be beneficial.' All the way up the chain of command the attitude was the same. `This officer is quite unfit to hold a commission'. 'This officer has been warned repeatedly and given every opportunity to improve himself'. recommend that Lieut. Sinclair's Commission be cancelled'. On 25 May the War Office wrote to the C in C Scottish Command, In view of the officer's addiction to alcohol, it has been decided that he is to be called upon to resign his commission, failing which steps will be taken for his removal from the Service'. Jack Sinclair knew what was coming. The previous day he had written a long letter to be included with his resignation. In it he outlined his military service, attempted to explain his behaviour and in effect asked for his case to be reconsidered. 'I hope that you will understand that it was more disappointment, worry and ennui that made me inattentive to my work. I have now settled down', he continued, 'and I know you will have no further cause to accuse me of misconduct. I exceedingly regret all that has passed but it has been a lesson to me which I shall not forget.' At the War Office F.C. Beatson, whose decision to call a Medical Board following Sinclair's first run in with the authorities had provided an escape route, commented scathingly. 'I have little faith in promises of amendment from persons of this habit and suggest previous decision be adhered to.' It was. Despite a last minute appeal to Sir Edward Carson, Jack Sinclair's resignation was gazetted on 29 June 1915 and became effective the following day. The Army was quite within its rights. It could not tolerate an officer failing to be punctual, showing little inclination to improve or turning up drunk for musketry training; he had been given a chance and failed to take it. Such behaviour would not have been tolerated from a soldier of humbler rank and Jack Sinclair had probably only got away with it for as long as he did because he was an officer. Nevertheless there was more to his case than 'addiction to alcohol'. He had not joined up to train in Scotland. He had gone out of his way to enlist and was obviously keen to see active service. In November 1914 his brother Thomas had received a letter from Lord Roberts informing him that, `there is no chance of the Canadian Contingent going abroad next week or for some time to come.' It seems that Jack had prompted him to make enquiries on his behalf The same month his old CO, the Earl of Longford wrote, 'I should think you are as likely to go to the Continent as I am at present.' Clearly his intention was to get to France; in Scotland he was bored and restless. Jack Sinclair was a man who had spent his entire adult life doing things. As the News Letter and Standard noted, he had soldiering rather than banking in his blood'.28 In his letter to the Army Council his sense of frustration was obvious. 'This this appointment to the Cameronians] was on the 24 Nov. last and I have been here since. It is most disheartening as I was very keen on seeing some further service, furthermore the Machine-Guns I was with arc at the front and have done very good work.' Jack Sinclair's enthusiasm for adventure, his impatience and frustration had got the better of him and ultimately cost him his commission. The Argylls were part of the 33 Division and in the summer of 1916 they were on the Somme. On 18 August they had been in action in High Wood. Withdrawn from the front line the next day, they were back in it a week later, the day that Jack Sinclair joined them.36 Twenty four hours later they attacked a German strongpoint in Wood Lane between High Wood and Delville Wood.37 'Repulsed owing to heavy machine gun fire and sniping'38, they tried again the following day, this time with more success. The cost was 23 men killed with others wounded and missing. Jack Sinclair was at last getting the action he had been seeking since enlisting in Canada nearly two years earlier. Much of the next two months was spent in the areas around Doullens and Sus St. Leger. Time was taken up absorbing new drafts and training. There was also some time for recreation and the Battalion Diary records that an intercompany football competition was won by 'D' Company. On 19 October, though, they began their move hack to the front firstly in French buses and then on foot, arriving at Barnafay Wood on 23 October. Captured early in July, it now lay some 8km behind the front line east of Lesboeufs where 2ASH were heading. The following clay 33 Division moved up. The following day, 'the rudimentary trenches had been deepened [though] the position was ... overlooked by the enemy to whom situation maps allotted Hazy Trench, Misty Trench, and other apt names. The "trenches" were figments of the Staff imagination, but the names had a colloquial use in pointing the whereabouts of the groups of shell-holes that served the Germans well for concealment and defence.' ... The conditions were 'a trial of endurance', he wrote on 27 October. 'Anything I have seen out here yet was picnicking compared with these four days ... it has been horribly raw, with mist or occasional drizzle ... food can neither be cooked nor sent up warm. How the men ... have stood these trenches is beyond my understanding'. Four days later Dunn was back where the Argylls had been engaged. On 4 November he wrote, 'Daylight is revealing', he wrote. Any way one goes to Dewdrop is through a shambles. Nowhere have I seen the dead in such numbers on so little space or of so many units.' In all probability Jack Sinclair was one of them. 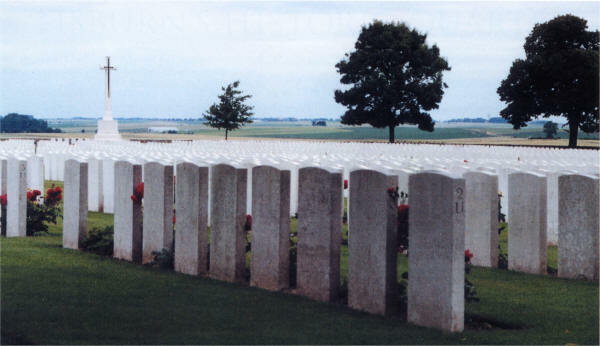 Guards Cemetery Les Boeufs, Somme in 2002. We will never know where his body lies. It may have been scattered to the four winds or still be out there amongst whatever remains of Dewdrop trench. It could even be beneath the Al motorway which links Paris and Lille and runs right through the area attacked by 33 Division. Alternatively it may be amongst those that were reburied in Commonwealth War Graves Commission cemeteries after the war was over. If this is the case, then which one? 1 The date 26 July 1879 in his school records at Campbell College would presumably have been given by his parents. Sinclair's (hereafter JHS) Boer War Attestation Papers — WO 128/32 — implies a date of birth of June 1879 but he may have lied about this to satisfy the 20 year old requirement. His Attestation Paper in CNA gives 24.3.1880. His Service Record in the NA Burnt Documents gives ages that imply a date of birth between 13.8.79 and 31.7.1880. 2 In National Archives W0339/22596 JHS gave his service with 45IY as dating from December 1899. 3 According to his Attestation Papers in W0128/32 he was a landowner. Like JHS he was discharged at his own request in November 1900. 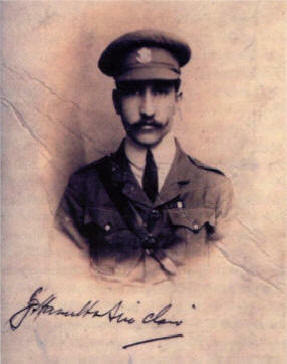 During the Great War he served in the RJR and died of wounds on 15 April 1918. He is buried in Wulverghem-Lindenhoek Road Military Cemetery south of Ypres in Belgium. 4 According to JHS's obituary in the Belfast Newsletter, quoted in the Lisburn Standard 24.11.16, p. 5. 5 Brigadier General Thomas Pakenham, Earl of Longford. Born at Dublin; commissioned 1887. Served in the Boer War where he commanded 45IY. Killed in action on Scimitar Hill, Gallipoli on 21 August 1915 aged 50. 6 K.J. Asplin, Imperial Yeomanry — Brief History, 2 volumes (Privately published by the author, 2000) p.5. 7 According to his Attestation Paper and obituary quoted in the Lisburn Standard 24.11.16 p.5. 8 Asplin. Vol. 1 Introduction. 9 In Conan Doyle's opinion, the casualty lists show that the Yeomanry took considerable punishment before surrendering, hut do not permit us to call the defence desperate or heroic.' A Conan Doyle, The Great Boer War (London, 1902). Chapter 27. 11 Asplin, Vol. 2, p. 498. 12 On 22 February 1901, according to his Boer War service record. 14 'The morale of the men was low, men volunteered for service with the Transvaal Constabulary and other police forces to escape the monotony, regular units snapped up the "prime material" of the yeoman as officers and various Government departments offered these literate men fine jobs'. Asplin, Vol. 1, p.7. 15 Army List July 1902, p. 413c. According to his letter to the War Office 24 May 1915, W0339/22596 Longford and Major Leonard T. [or J] Capper recommended him for his Commission. See final paragraph. 16 JHS's letter to the Army Council included with his resignation 24 May 1915. W0339/22596. 17 JHS's obituary in the Belfast Newsletter, quoted in the Lisburn Standard 24.11.16, p.5. 18 JHS's letter to the Army Council included with his resignation 24 May 1915. W0339/22596. 22 According to the Lisburn Standard 24.11.16 p.5, he was 'in an out of the way part of Saskatchewan'. 23 JHS's obituary in the Belfast Newsletter, quoted in the Lisburn Standard 24.11.16, p.5. 24 Aged 34 years and 7 months according to his attestation papers, hut that is based on his elate of birth being March 1880. 25 JHS's letter to the Army Council included with his resignation 24 May 1915. W0339/22596. 26 JHS's obituary in the Belfast Newsletter, quoted in the Lisburn Standard 24.11.16, p.5. 29 There are several versions of his Attestation Paper in the "Burnt Documents" in the National Archives: some give his place of enlistment as the Curragh, others as London as does Soldiers died in the Great War. 33 Between January when Jack Sinclair arrived in France and 16 July 1916 the only two casualties suffered by the battalion were the deaths of two men who had been transferred to other units. 34 NA Burnt Documents W0363 S 1750. 35 NA Burnt Documents W0363 S 1750. 36 There is no mention in the Diary of any new arrivals on 26 August when JHS's service record says he joined them. Hardly surprising given that the battalion were in the front line. 37 C. McCarthy The Somme — The Day by Day Account. (London, 1993), pp.83, 90. 38 2ASH Battalion Diary W095/2426. 39 According to the Battalion diary, early in the morning of 28 October the 1st .Middlesex and 4th Kings part of 98 Brigade 'attacked and took successfully Rainy and Dewdrop trenches' which lay due east of Lesboeufs. In fact Dewdrop was recaptured in a German counterattack. McCarthy, Somme, p.142. 40 The Battalion Diary gives 2 officers and 3 other ranks killed in action and 3 officers and 13 OR [ordinary ranks] wounded on 28 October. 12 OR killed and 1 officer and 22 OR wounded on 29 October. The total killed over the two clays is 2 officers and I5 OR. WOCL has 2 officers and 14 OR killed over the same period. 41 The Battalion Diary gives a total of 86 casualties 21 killed and 65 wounded between 27 — 31 October. WOCL has 22 killed. For 31 October the War Diary gives 2 OR killed and 19 wounded, WOCL gives 5 KIA. 42 If he was born on 26.7.1879 he would have been aged 37, if between 24.3.1880 and the end of July 1880 he would have been aged 36. 43 19 are listed in the WOCL as KIA. One man who died of wounds on 29 October and is buried at Carnoy probably survived long enough to be taken a little hack from the front line. 44 The other is buried at Carnoy further hack. Presumably he survived a little longer than the others. 46 JHS's obituary in the Belfast Newsletter, quoted in the Lisburn Standard 24.11.16, p. 5.